The outbreak in North Kivu is currently centred in the Mangani health area of the Mabalako health zone, which is situated in the Beni territory, adjacent to the Ituri Province in the north and Uganda in the east. The affected area is linked to the surrounding localities by road, an airstrip and a lake port. Through its airstrip, Beni territory is directly connected to two international airports, Goma and Kisangani, which also connects the territory to the rest of the DRC, including the country’s capital, Kinshasa. There are numerous communities living along the border with Uganda, which suggests strong cross-border ties and movement. All these factors indicate a potential risk for spread of the outbreak. The North Kivu Province is densely populated with 8 million inhabitants. The Beni territory has a population of 1.5 million people, of whom 800,000 live in the town of Beni. The Mangani health area itself has 30,000 inhabitants, further increasing the risk of the outbreak spreading. Between 11 May until 07 August, 36 deaths were recorded out of a total of 43 cases. Out of the 36 deaths, nine are confirmed as Ebola and 27 are labelled “probable” as these happened a possible outbreak was raised and need further investigation. Beni town is a centre of commerce where people from Mangani, an agricultural community, bring their produce to sell. Travellers and traders from Beni pass through Mangani to reach Mambasa and then Kisangani. Others pass through Mangani and then Beni to reach Butembo and Goma (south), Komanda and Bunia (north), as well as Uganda (east). 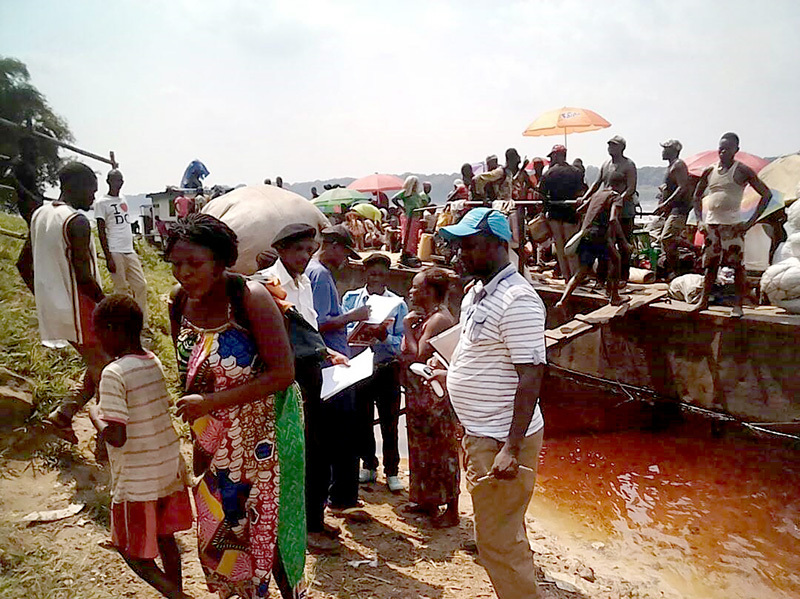 IOM has deployed an epidemiologist to Beni as part of the coordinated response to this latest outbreak. North Kivu is also affected by insecurity and decades of conflict, hosting approximately one million internally displaced persons (IDPs). Although there are no displacement camps in Beni Territory, more than 12,000 IDPs are living with host communities in Kasindi town in Beni Territory near the Ugandan border. In June and July of 2018, nearly 2,400 IDPs returned to Kokala, a health area north of Beni town. The majority of the over 270,000 DR Congolese refugees living in Uganda are from North Kivu. The influx of Congolese refugees into Uganda has been continuous since 2012. IOM has started a mobility mapping exercise to track population movements in the area, which borders with Uganda. It also intends to carry out health screening and promote hygiene at key points of entry. IOM has identified 28 points of entry to the affected area that need immediate implementation of prevention, surveillance and communication activities. IOM will support Health Ministry to strengthen coordination with neighbouring countries at national and community level. In relation to this, IOM hosted a training for 40 Government health staff on health screening, hand washing and risk communication to enhance the effectiveness and the quality of health screening in Goma Airport, Petite Porte and Grande Porte at the border with Rwanda. In addition to responding to this most recent outbreak, IOM is supporting communities affected by a previous epidemic in Equateur Province. To ensure the outbreak does not recur, IOM is continuing its prevention, surveillance and communication activities in that Province.